This weekend I got the itch to do some baking. It had been awhile since I baked for fun, not because I needed to bring something somewhere – and it was just as relaxing as I’d hoped it would be. Doesn’t hurt that I got to have brownies at the end of it too, which is definitely one of my weaknesses. I’d take a good chewy fudge brownie over just about any other treat, any day. This one was even better because it was a joining of two of my favourite recipes. I’d like to say it was because I had this genius moment, but really it came down to a severe lack of supplies in the cupboard. I had just enough sugar (well, actually I was still short and used some stevia. See the note below the ingredients), the bag of chocolate chunks was getting suspiciously low from our late night snacking and I was scooping the last of the flour out of the bag. Of course, going to the store was not an option, right? 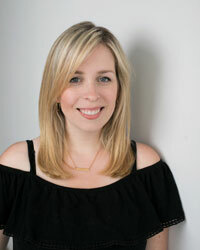 Who wants to get out of their comfy Sunday morning yoga pants to go grocery shopping when snuggling up on the couch with the dogs and watching a romantic comedy (It’s Complicated) is so much more appealing. That movie always makes me want to bake when I see that kitchen. 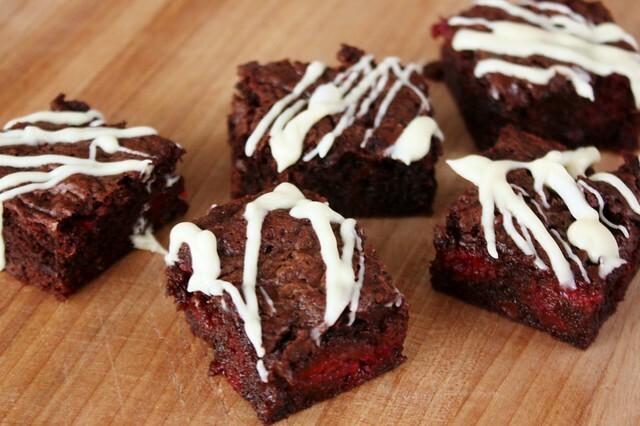 Put them together and you have delicious bite sized fudge brownies with a crunchy chewy coconut topping and a secret melted chocolate inside from the chocolate chunks. 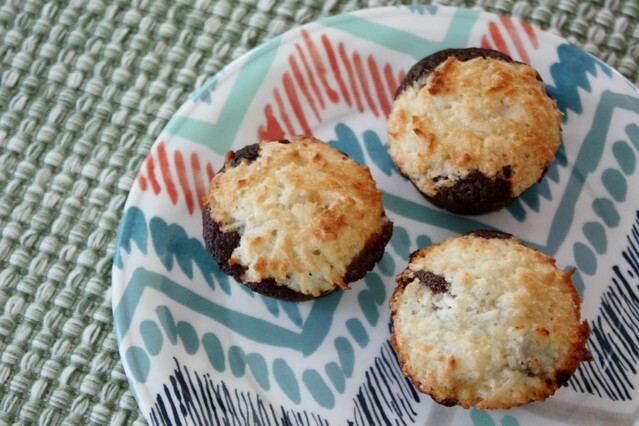 These Coconut Macaroon Brownie Bites turned out even better than I expected and were ready in less than 30 minutes…and then it was back to Meryl Streep, Steve Martin and Alec Baldwin…but now I had brownies in hand! NOTE: I was short on sugar so I replaced about a quarter of the sugar in the brownie batter with the equivalent amount of a stevia alternative sweetener and you couldn’t tell the difference. 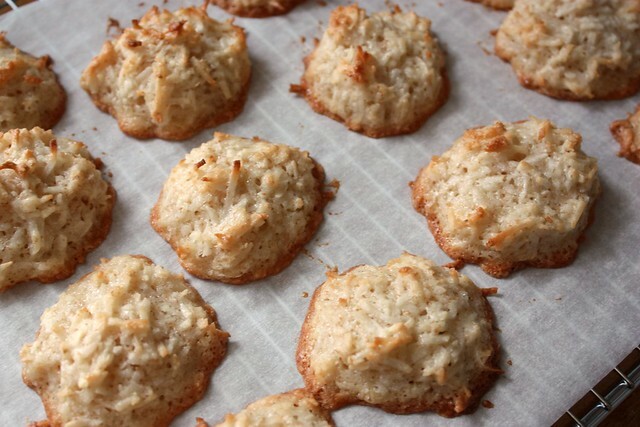 Keep that in mind if you’re trying to reduce your sugar consumption, but remember to keep the sugar in the macaroon topping to give it that caramelized look. Preheat oven to 350°F. 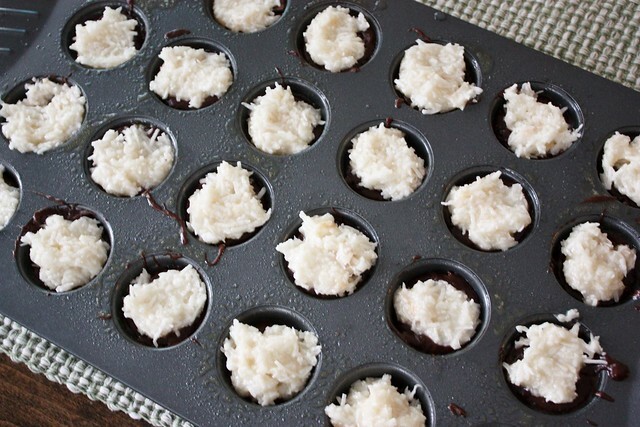 Grease a mini muffin tin with cooking spray or oil. In a medium mixing bowl, add the butter, vanilla, eggs and sugar. 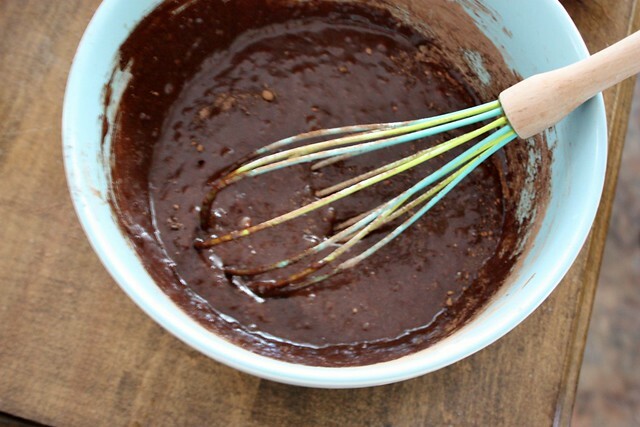 Using a sturdy whisk or spatula, mix until they are well combined. Add the flour, cocoa powder, espresso powder, baking powder and salt. Stir until just combined and no lumps remain. 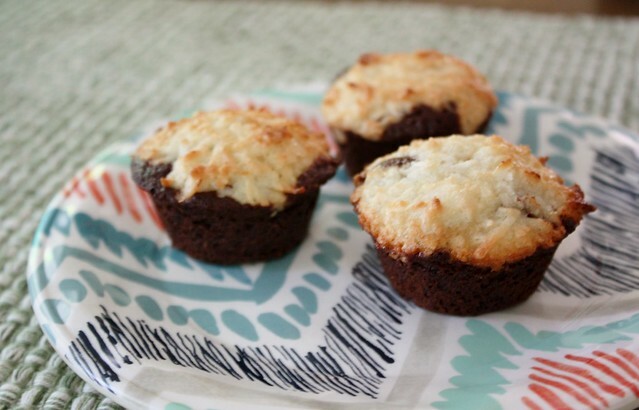 Spoon the batter into each mini muffin tin cup until they are about halfway full. 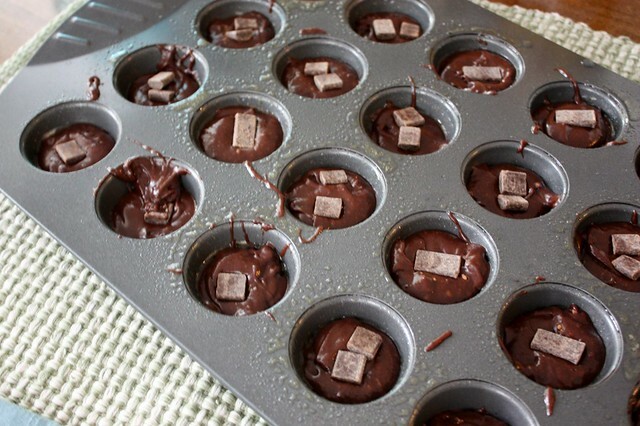 Place a few chocolate chunks or chips in the center of the batter in each cup. 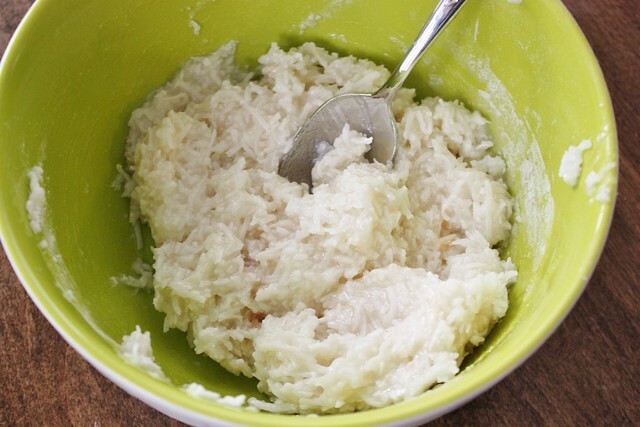 In a small bowl, combine the coconut, sugar, flour and salt. Stir in egg whites and vanilla and mix well. 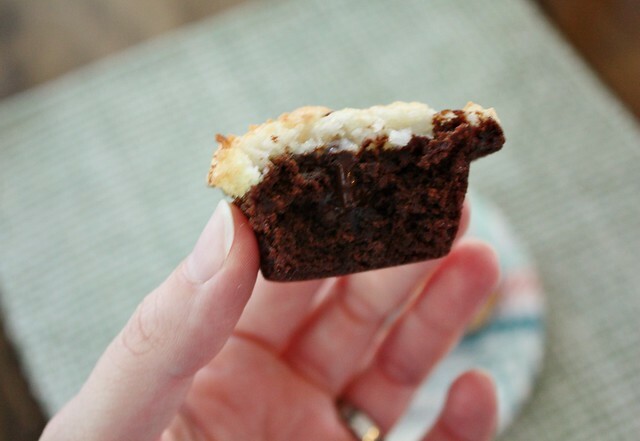 Drop a small spoonful of coconut batter on top of the brownie batter. 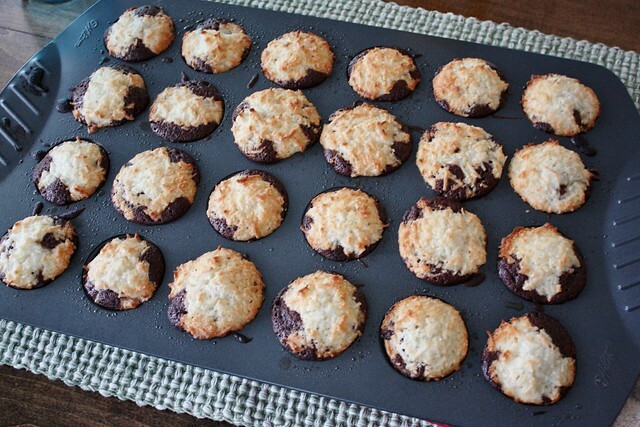 Bake for 10 minutes, then set the oven to Broil and brown the tops for up to two minutes, or until the coconut is golden, watching it the whole time. DO NOT walk away at this point or it can burn. Allow the brownies to cool in the pan on a cooling rack for 5 minutes, then remove from the pan with a knife and allow to continue to the rack. We ate our fair share on Sunday and then packed up the rest to take for treats with lunch this week. They’d also be great to bring with you to a summer BBQ, as a gift to a new mom or for a cookie swap!